It was December 29th, the Feast of the Holy Family. I was sitting at my laptop in the dark while the lights on the Christmas tree twinkled merrily in the living room. The last Mass of the day, 7:00 pm –a.k.a. “the last chance Mass”, was finished so I thought I’d try to decompress from the maelstrom that has become the Christmas season at my house by reading all the posts and email I had been putting off. It was a good Christmas season but, as usual, the extra Masses, rehearsals, concerts, preparations, commitments, as well as shopping, wrapping, baking and the normal family festivities at my house with the kids and grandkids had me pretty much worn out. I made a snack and sat down for some quiet “me” time. I checked my Facebook page, Twitter feed, and email and saw that there was a new message from the pastor. The subject line was titled, “And now…Lent!” I could feel the corner of my eye start to twitch. 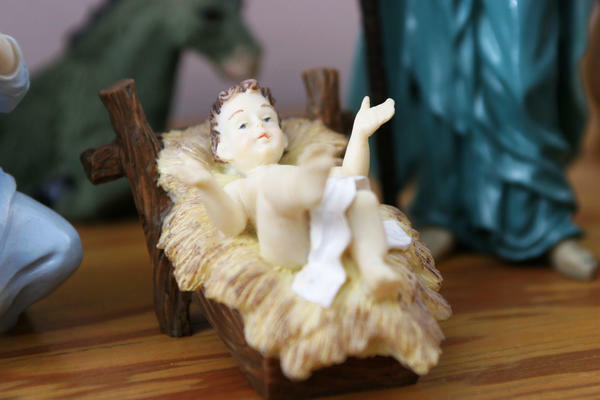 Baby Jesus was still smiling happily in the manger of my Nativity set on the table waiting for the arrival of the three Kings and Father’s planning a meeting about Lent? I began and erased several replies that all began with a version of, “Seriously?!?!?! ?” but I resisted and chose not to respond for the time being. There’s no need to detail the rest of my thoughts that evening. Since then we’ve had our meetings to put our ideas together for the upcoming Lenten season; first just the two of us, then the pastoral staff, then the liturgical committee. He wants to get everyone on board and thinking about the next phase of the year. We have the advantage of a couple extra weeks of Ordinary Time this year before we face Ash Wednesday. From there it builds and builds until the big guns come out for Holy Week. Church folk have a different way of thinking about things like seasons and celebrations. Our seasons are predictable, ritualized and even color coded; purple, white, green and the occasional red or rose (not pink, Father reminds us – Rose). Even our calendars are different with the beginning of the liturgical year coming on the first Sunday of Advent. The email got me thinking however, about these feasts that we love and celebrate. Just as every sunny day has shade, so every Christmas has dark and grey shades of Lent that hover over them like ghostly images floating in the corner of a family photo – some hidden and some blatantly obvious. There is a shadow of a cross loomimg over the manger. It’s not something we like to think about during the Christmas season, but you can see it if you draw a symbolic line from the wood of the manger to the wood of the cross. We understand that Christmas would make no sense if not for the suffering, death and resurrection of the very same sweet, cuddly baby described in our poetry and carols. It’s not just the birth of an infant…it’s the sword of sorrow that will pierce Mary’s heart. It’s the cry of hundreds of mothers over their slaughtered children. It’s the mysterious gift of myrhh and the narrow escape. It’s the eventual way of the cross. Unlike the world’s concept of time, the Church moves us through the liturgical years, not by a timeline, but more like a spiral. Each season’s beginning is merely a path toward the next one. We mark the time with our traditions and celebrations of feasts and solemnities, allowing ourselves to be moved emotionally and spiritually through joys and sorrows, glorias and lamentations, triumphs, defeats and triumps again, light and shadows, death and life and resurrection. Each year we carry on rituals and traditions to remember them. In the Church and in our homes we ritualize our family times together. We decorate our homes with light in the darkest time of the year and gather our loved ones near to us. We tell them stories – the same stories over and over – of wars and farming, marriages and babies, kings, heroes and paupers. We tell stories about our grandparents and the olden days; of hard times, regret and shame, deception, infidelity and of wallowing in the ashes of failure. We tell stories of promise and redemption and unspeakable joy and never tire of telling them because they’re so much a part of us and telling them helps us make sense of our lives. Then we add our own stories to them so that our children will remember them and the lessons they teach and will, hopefully one day, tell them to their children. So now…Lent! Not here yet, but coming. Let’s do this. This entry was posted in Catholic, The Church Diva and tagged Christmas, faith, Family, Lent, Liturgy, stories. Bookmark the permalink.